LUCREZIA BORI was a Spanish operatic singer, a lyric soprano and a tireless and effective fundraiser for the Metropolitan Opera. 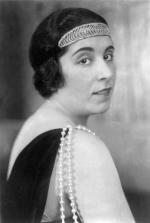 Her career at the Metropolitan Opera began in the summer of 1910 during the Met's first visit to Paris. On June 9 of that year she replaced a singer who had become ill in the role of Manon in Puccini's Manon Lescaut. On the opening night of the 1912-13 season, she made her debut with the Met in New York when she sang Manon opposite Enrico Caruso. In 1915 she was forced to stop singing for a surgical operation to remove nodes on her vocal cords. Following a lengthy convalescence, she returned to the stage in 1921. During the course of her career with the Opera, she appeared a total of 654 times and sang the leading role in 39 operas. Wikipedia contributors. "Lucrezia Bori." Wikipedia, The Free Encyclopedia. Wikipedia, The Free Encyclopedia, 4 Oct. 2016. Web. 16 Feb. 2017.